Alor, Bukit Bintang 2017. Bukit Bintang is a very famous area, located near the favorite shopping place in Kuala Lumpur. I went to Kuala Lumpur at that time to watch the 29th SeaGames, Malaysia become the host of SeaGames the biggest sports event in Southeast Asia. I went there with one of my senior and coach from West Java pencak silat team. Actually my feelings were mixed between happy and sad there, I am happy to be able to watch the Pencak Silat match there, but I am also sad because my mother was the coach for Indonesian Pencak Silat National Team, but I as her child failed at the selection to enter the national team because at PON (National Sport Week) in the previous year’s I lost. Fortunately, Bukit Tinggi is like a painkiller for me, especially the food. The location of the Pencak Silat sports venue is at KLCC (Kuala Lumpur Convention Center), that near from Bukit Bintang, it only took us 15 minutes walk to the Pencak Silat venue. Bukit Bintang is one of the destinations for tourists both local and foreign. Fortunately, the venue of Pencak Silat is in the middle of the city and surrounded by many tourist attraction and shopping malls like Berjaya Times and Kuala Lumpur Tower. Berjaya Times the fifth largest building in the world, it has over 1,000 retail stores and 65 food outlets. Kuala Lumpur tower the popular landmark of Malaysia after Petronas twin tower at least 100 meters higher than the Twin Tower’s Skybridge and also Currently the 18th-tallest freestanding structure in the world, and many others tourist attractions that are quite pleasant. The crowd of the Kuala Lumpur metropolitan city was felt in Bukit Bintang, and that’s quite enough to treat my sadness because I did not have the opportunity to be in the national team of Indonesia in the 24th SeaGames Malaysia this year. In Bukit Bintang, there was a street called Alor located in the behind of Bukit Bintang and it was very strategically area for those who were tired after shopping all daytime then going to Alor street was the best choice. Alor street was a very unique food destination in the heart of Kuala Lumpur, Malaysia, and it was Called the cultural heart of the city’s local cuisine. There was no modern shopping center in Alor street, which is on Alor street it was more like Malaysia in the past, the feel in here most like Braga street in Bandung. Alor Street at day and night was very different, during the day there are not many activities on Alor street, it was just like an ordinary road like other roads in Kuala Lumpur. When the night Alor street turned into a night market filled with very diverse food like Indians, Chinese, Malaysian, and many others, the road would be busy with many food stalls and restaurants. The road was closed for vehicles, Alor street could only be passed by pedestrians until the morning. That was a glimpse of the atmosphere on Alor Street, Kuala Lumpur, Malaysia. It was indeed a culinary attraction, precisely in the elite area of Bukit Bintang, Kuala Lumpur. It was not too difficult to find Alor street, it only took about 5 minutes from the Bukit Bintang monorail train station to King Chulan. Unlike the others Bukit Bintang areas that were filled with elite and expensive shopping centers, Alor street was actually a paradise for fans of cheap food and street vendors. I stayed at Pullman Kuala Lumpur hotel for 3 days with my senior and coach, the distance from the hotel to Alor street was quite far when referring to the map, but in fact, it wasn’t. Because Bukit Bintang was filled with malls and shopping centers that are crowded for almost 24 hours, the trip from the hotel to Alor street does not feel far at all. During the day the way to the Alor street we passed through the shopping center of Bukit Bintang was crowded every day by locals and foreigners. In the evening many nightclubs that started operating around Bukit Bintang accompany my way to go to the hotel after being satisfied with a culinary tour on Alor street. Some of the culinary delights offered by Malaysia were served here, along with the sidewalks and rows of hawker stalls. On Alor street, these hawker stalls would take both sides of the road which made this road look like a night market. Alor street was not only a place for locals but foreigners like me and two of my friends, another tourist often visited here to taste for unique foods that they could not find in their country. Mostly the food offered here was from Chinese, Malaysian and Indian people because these three descendants were the most population in Malaysia. One thing that was unique in Alor street that I found out was in every restaurant or hawker stalls there must be one employee that there to be a translator for foreign tourist, which made the foreign tourists easy to order or choices food in the menu that served there. Alor street was very popular with their unique cultural food, and the most delicious thing, in my opinion, was the musang king durians, which was mostly sold in every hawker stalls along Alor street. Yep, I am a durian connoisseur, I love this one fruit so much and the decision to visit Alor street after watching the Pencak Silat match at KLCC was a very right decision for me. Actually, my senior who suggested us to going to Alor Street after watching the match, he had traveled to many countries not only Asia but also Europe, he travels alone only to refreshing and took pictures from various places around the world. So it was not surprising if my senior really knew the area in Bukit Bintang, especially the place which was recommended for tourist and he knows what should be there. Even though I still feeling sad about the national team because I have not had the opportunity to compete in the SeaGames event to present my homeland but, the durian musang king works to me like a painkiller for my sadness. The taste of durian musang king makes my sadness disappear because the taste of durian musang king was very legit and very tasty. Durian musang king was the most delicious durian in the whole world. If someone who was a durian lover had not tasted this kind durian, then they could not be called as a true durian lover. 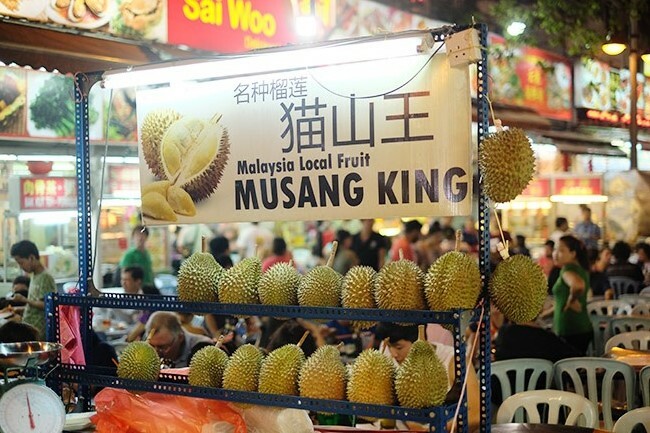 "Prices will not lie to the quality", maybe the utterance was very well anchored to this kind of durian, because the price of durian musang king was very expensive compared to other durians such as durian XO, Montong, Mao Shan Wang, or durian Matahari. The expensive price of durian musang king was very worthy I think, because of the pleasure offered by this durian treat the person who ate this like a king.